Military Veterans deserve a certain degree of respect. Putting their lives on the line for millions of people they don’t know, is simply how its done. Whether it’s wartime or peacetime, the sacrifice they’re willing to make is still there, it’s all the same; a willingness to fight for our Nation’s freedom at any cost. That’s exactly how I felt after I spoke with U.S. Air Force Veteran, Billy S. and his dog, Copper, who Vets and Their Pets is proud to be helping through the VA, and some very generous volunteers. When we met Billy via the VA, he had just been released from medical treatment at the VA hospital, and had learned that everything he owned had been stolen. Unfortunately, Billy is homeless (a fact that he is neither proud of nor happy about); he stored his belongings behind a nearby business while he was receiving medical care, and what little he had was picked through and stolen. No clothes, no sleeping bag for the cold cement, nothing to keep him warm as the Arizona nighttime temperatures dip to well below 40 degrees now, and in the months to come. 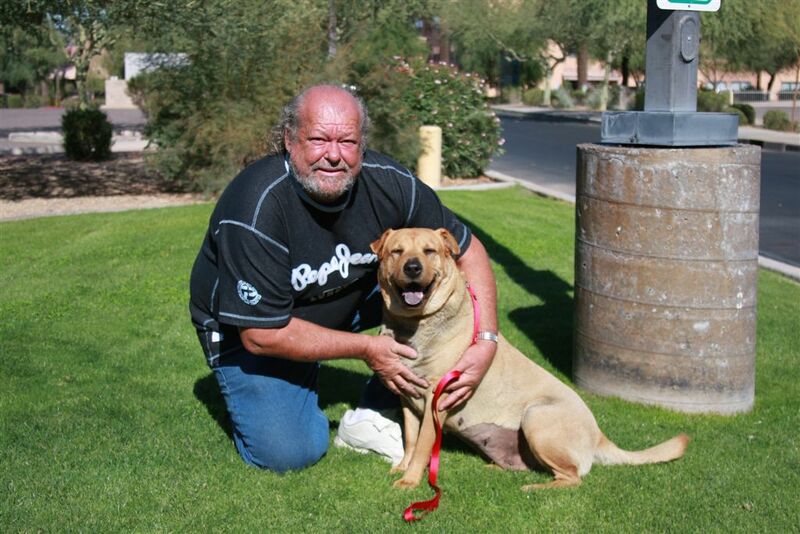 We’d recently helped Billy with his 5-year-old dog, Copper, a very sweet Sharpe/Akita mix, by boarding her at the Arizona Pet Resort during his treatment; now that he was released, was excited to get back to her. Copper is all the family he has, and Billy loves her more than you would believe. Billy will go without before he’ll let Copper do so, and she does a pretty good job at taking care of him, too. 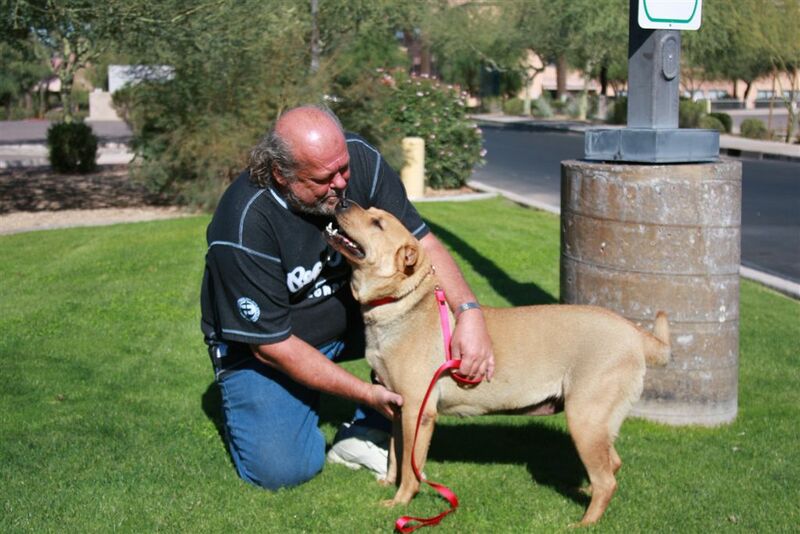 In fact, everyone who meets Copper tells Billy what a wonderful dog she is, sweet, loving and full of care. Through our relationships with several local veterinarians, Vets and Their Pets was happy to help Copper get spayed, and receive the shots and check-up she needed. However, it didn’t end there. Billy said “Because I’m a vet, you did it out of the charity of your heart”, referring to Vets and Their Pets Executive Director, Michael West’s willingness to drive Billy to visit Copper several times while she was recovering from being spayed, and Michael’s ensuring Billy had a warm, safe place to stay for the Thanksgiving holiday week-end, putting him in a local motel that accepted dogs – all on his own dime. “He’s a 200% guy”, said Billy, “everybody he helps, their heart should go out to him.” Michael also made sure Billy got a warm meal on Thanksgiving, and some new clothes via the generosity of MANA House. Vets and Their Pets is lucky to have someone as kind-hearted as Michael volunteering and running the show. An Arizona native, Billy was a homeowner for over 35 years before his house went into foreclosure last Christmas. With no family, and nowhere to go, he was forced onto the street. Willing to work despite physical ailments, Billy’s attitude is inspiring: “A good day’s work makes you feel viable”, said Billy, an experienced auto mechanic and former Palo Verde Nuclear Generating Station employee. Several accidents and a poor economy left Billy unemployed, while he took in family members and generously let others stay at his home who were in need prior to last year. 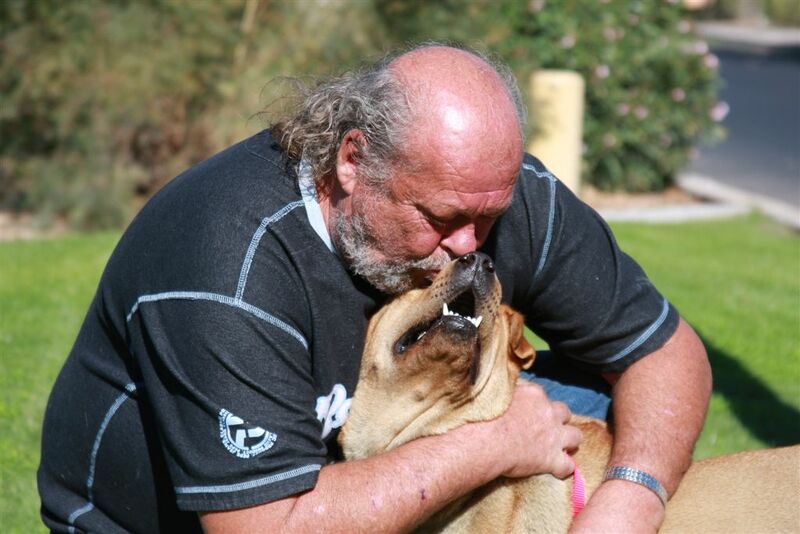 Now Vets and Their Pets is hoping to return the favor of Billy’s generosity to others, and to our Country, and help Billy find a place to stay that accepts dogs, and to once again ‘feel viable’. Billy is a uniquely honest and wonderful person; but his story isn’t uncommon. Vets and Their Pets needs your help, as we help homeless and in-need Veterans with pets get the medical care and transitional housing they need, and return to a life where they can ‘feel viable’. We are in desperate need of pet fosters to take care of Veteran’s pets while they receive the services they need, and sponsors interested in helping to support Veterans as they get back onto their feet. Please help us help our nation’s heroes, by keeping Veterans together with their valuable pets, who so often serve as therapeutic aids and emotional support, as well as man’s best friend. Please contact us with any way you’re willing to help, including volunteering with Vets and Their Pets! Vetsandtheirpets@Valleydogs.org I 480-898-3647. 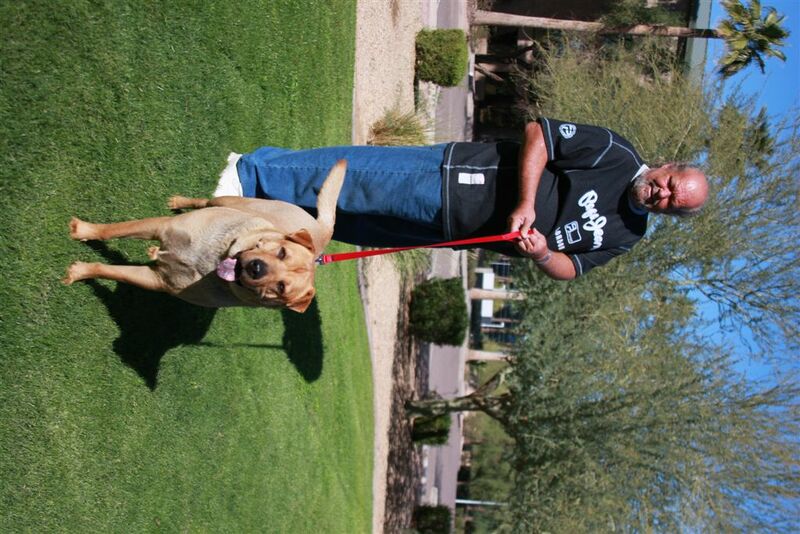 This entry was posted in Billy & Copper, Dog Health and Nutrition, foster tails, Helping Others, Sponsors, Veteran, Vets and Their Pets and tagged Air force veteran, Arizona news, Billy and Copper, dogs, Feel good story, fostering dogs, homelessness, military, News, pet adoption, Phoenix News, Phoenix volunteering, sponsors, veteran, Vets and their Pets, volunteer, volunteering. Bookmark the permalink.